In Hlaing Thayar, a poor industrial suburb west of Yangon, we helped the Salesian Brothers – Don Bosco – to find a major donor for the large new vocational training center (200 feet by 50 feet). The training center should help 45 – 50 youths between the ages of 18 and 25 to receive a basic education and to learn a professional trade such as mechanics, welding, engineering, computer technology, or printing. The education is non-formal and focuses on street children and young adults who could not finish school because of poverty or because of discrimination due to race or religion. The training center includes training facilities, classrooms, study hall, dormitory, offices, and a recreational room. 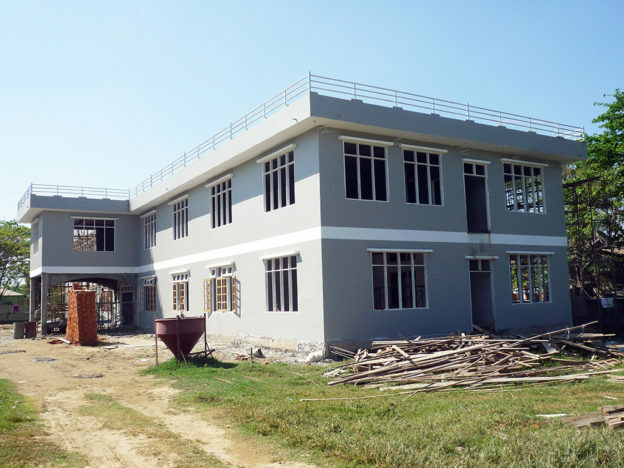 The construction of the two-storey vocational training center by the Salesians progressed rapidly and the building could be completed in 2015. The training courses for the youth commenced in 2016.